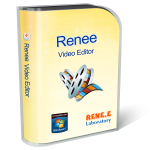 Renee Video Editor is an easy to use software. Everyone can edit any video or audio files easily. Multiple edit tools are available in Renee Video Editor. How to purchase the full version of Renee Video Editor? Can I add a link to Renee Video Editor on my website? Of course, we’re glad for your help to promote Renee Video Editor.